Because UMass Online represents a consortium of five of the six University of Massachusetts campuses, it doesn't appear on most lists of biggest online institutions. Despite flying under the radar since its inception in 2001, the program has shown steady growth in recent years. University officials attribute the success to the consortium model, in which the individual campuses administer courses, while the system provides marketing, branding and other services at the campuses' expenses. "It is really the best of centralized and decentralized," said Marcellette Williams, senior vice president of academic affairs, student affairs and international relations for the University of Massachusetts system. UMass Online’s course enrollments have grown steadily in the last five years, up from 54,000 in 2012 to more than 75,000 this past school year. Besides increasing enrollment, the system offered approximately 160 degree programs during the past academic year, up from 145 in 2012. Officials said that three to five programs are being added each year. Not only are the numbers of students and programs way up, so are revenues -- $104 million in total for the five campuses during the 2016-17 academic year. Revenue in fiscal year 2012 totaled $72 million, and has grown between 7 and 10 percent each subsequent year. UMass Online undergraduate courses cost the same as face-to-face classes at the UMass campuses. Many master’s level courses also cost the same in either format, but some cost a little more online. Institutions don’t typically publicize their online revenue, so making comparisons with UMass Online’s reported revenue is difficult, analysts said. Public university systems have had a mixed record of offering online degree programs since the early 2000s. Some, like those developed by Penn State World Campus and the Indiana University System, have carved out solid success. Others, including efforts at the University of Illinois , have flamed out when costs became prohibitive. Others still, like California State University’s online program , came roaring out of the gate, only to shrink after a coherent strategy failed to coalesce. 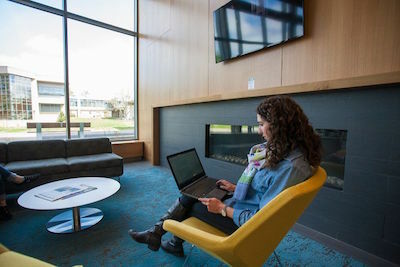 Models differ from freestanding institutions that offer degrees, like Penn State World Campus, to consortiums like UMass Online, which offer online degrees through existing campuses. Administrators at UMass Online attribute the consortium’s success in large part to what they see as a sturdy decentralized business model that puts students first, empowers educators and gives profits to the campuses. About three-quarters of UMass Online’s total revenue goes toward operating expenses; the remaining quarter is profit that goes to the five member campuses, according to UMass Online CEO John Cunningham. “There’s no motive for me to reel in extra expenses or operations because the goal is to support the campuses as much as we can,” Cunningham said. Approximately one third of the revenue funds faculty salaries, and another 20 percent goes toward student support and instructional design. Another portion heads to the offices of the registrar and bursar. Cunningham is particularly proud that the success of the online effort has a ripple effect on the campuses, with more money available for new technology and other classroom enrichment. Each campus pays the system between 4 and 7 percent of its annual revenue for the online system’s marketing expenses, Cunningham said. Jeff Seaman, co-director of the Babson Survey Research Group, said he believes this amount is standard, and perhaps even low for a decentralized system. But its decentralized approach, in which the campuses develop and host their own programs and collect a significant percentage of the revenue, imposes some challenges and limitations. No methodology is perfect, after all -- but UMass Online officials believe it has one that works. UMass Online launched in 2001 as a shot in the dark from the university system’s Board of Trustees. The board knew the university's campuses had to go online in some form, although it didn’t have a roadmap to long-term success. Initial lofty ideas of hosting courses with 1,500 students each -- an early indication of the instinct that later blossomed into massive online open courses (MOOCs) – burned out relatively quickly, according to Jacquie Moloney, chancellor of University of Massachusetts Lowell who served at that time as dean of the institution’s division of online and continuing education. UMass Online’s setup emerged organically over time. In the early years, system administrators would ask for proposals from the individual institutions for a particular degree program. Then it would select the campus with the most inviting proposal to be the leader in that subject area. But, according to Cunningham, that model provoked occasional “squabbling” among institutions. By the mid- to late 2000s, administrators decided the atmosphere of competition had run its course. Now each campus has free rein to offer degrees in any subject, even if other campuses have similar or identical programs. This model opens up the possibility of a different kind of competition. But thus far, according to UMass Online leaders, similar programs within the system have co-existed without incident. “The limitation is the market,” Cunningham said. “You have to do some kind of market research and convince your provost you’re going to have enough enrollments.” The magic number tends to be between 10 and 12 students per course, he said; with a higher number, net profit begins. The concept of one institution’s program cannibalizing another has come up from time to time at the administrative level, according to Williams. “It’s a good healthy discussion to have routinely,” she said. But so far, similar degrees have distinguished themselves with unique courses or slightly different academic goals, Williams said. One campus offers a bachelor's of science in criminal justice while two others offer bachelor's of arts. Two nursing programs share some courses but one is for undergraduates and the other is for graduates. The fee structure for the individual campuses has also evolved since the consortium began. Until 2014, each campus paid UMass Online an annual fee of 10 percent of its online revenue. But a few years ago, according to Williams, the president of the UMass system, Marty Meehan, began asking provosts why it was necessary to charge each campus such a steep percentage. From that inquiry emerged a new approach: “Fee for Technology Services,” in which each campus pays a portion of the system’s annual operating budget for marketing and tech support based on the number of “unique users” in its online programs. That fee covers branding and marketing, technical support for individual campuses, including the Blackboard learning management system, personnel costs for technical support, facility rent, office costs, system-wide consortium memberships and a pilot program for emerging technologies that enables campuses to test new technologies before committing to a contract. There have been other challenges along the way. At Lowell, faculty skepticism has proved the most significant hurdle to overcome throughout the tenure of UMass Online, according to Moloney. She describes many Lowell professors as “courageous pioneers” who overcame their steadfast reluctance to teach online once they went through training and saw its practical benefits. Now, though some remain holdouts, others tout their online classes as the most fruitful of their careers, she said. “It’s had this steady growth and organic growth because of UMass Online’s model for really engaging the department and the academic colleges,” and listening to faculty members’ needs, Moloney said. UMass Online reports 75,000 online enrollments last academic year, but that number is more complex than it appears on the surface. Because UMass Online represents five individual campuses rather than existing as a separately accredited entity, administrators say, each campus’s online enrollment numbers are counted separately in the Department of Education's Integrated Postsecondary Education Data System (IPEDS). IPEDS data for 2016 aren't yet available, but the 2015 numbers reflect close to 10,000 unique students fully enrolled in online UMass courses. UMass Online reports its unduplicated headcount for 2016 was 29,005 students -- a number far lower than the 75,000 figure, which counts a student each time he or she registers for a course. Such disparate numbers make comparisons with other institutions difficult, according to Seaman. UMass Online's internal trends are more instructive because they follow consistent formulas. But each university tallies its students with its own metrics. "I believe their trends. I don’t believe the raw numbers," Seaman said. "I believe they were numbers that were meaningful to them, and calculated consistently." Though comparing institutions based on their enrollment data can be arduous, Seaman doesn't see the flaws in data reporting as a serious or insurmountable obstacle to understanding online programs in context. If federal requirements become more specific in the coming years, he said, institutions will be forced to provide data that's easier to examine side-by-side. "There’s problems out there," Seaman said. "It’s just minor noise in the overall system." Even with all of its successes, Cunningham acknowledges there are areas closed off to UMass Online as a result. Jumping into a new market for major growth, such as workforce development, is difficult under a decentralized model. He wants to pursue more non-academic professional workforce development opportunities, but those, too, don’t fit in neatly at any one member campus’s online efforts. “Shared governance,” as Williams puts it, also means that conversations about overarching changes require more conversations than they might if the leadership were in closer proximity. But as a counterbalance, discussions about UMass Online happen at the university leadership level on a monthly basis, usually by video conference aside, and four in-person meetings each year. “It’s that ongoing conversation that in my opinion is so dynamic and vital, to ensuring a kind of currency of programs,” Williams said. One partnership that started four years ago could be a template for future endeavors: UMass Online hosts courses developed for in-service high school teacher professional development for the Massachusetts Department of Elementary and Secondary Education. Room for growth remains; Cunningham doesn’t rule out the possibility that the UMass Online model could be modified if the right opportunity comes along. But for now, Williams argues that UMass Online straddles the line between centralization and decentralization for the “best of both worlds”: an overarching brand with trustee-approved priorities, and a set of institutions empowered to make decisions in their best interests. “It isn’t exactly cowboy-cowgirl land out there,” Williams said.